Anaconda Condo are spacious ski condos for sale in Copper Mountain Real Estate. These East Village condos are less than 200 yards to the Super Bee lift and border the fairway of the 8th hole of the Copper Creek Golf Course. Built in 1973, Anaconda is made up of 4 buildings with 24 units total. There is one deed restricted employee 1 bedroom unit, 9 – two bedrooms, 6 – three bedrooms and 8 – four bedroom condos. Anaconda in Copper Mountain offer some of the larger more spacious condos for sale in Copper Mountain Real Estate. After enjoying the numerous activities Copper Mountain and Summit County have to offer you can look forward to relaxing in the on-site, outdoor hot tub at Anaconda Condo. Some of the units come with 1-car garages, the garages have individual garage doors but the space is shared with usually three other garage owners. Many of the condos have superb ski area views from not only the living rooms and decks but from several of the bedrooms as well. 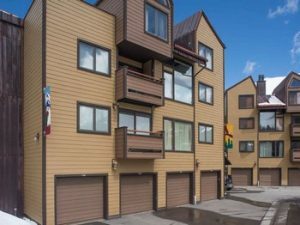 If you are looking for a larger condo for sale in Copper Mountain consider viewing the condos in Anaconda Condo today with Justin and Krystal Knott, LIV Sotheby’s International Realty.